This deck does so many of my favorite things. Any deck with Squee, Goblin Nabob is a deck that I’m a fan of. This one combines Squee with Bazaar of Baghdad to generate card advantage while stocking your graveyard for Goblin Welder tricks. As far as Welder shenanigans, this deck has a number of enormous monsters to buy back. Ideally, you’d like to rebuy Sharuum the Hegemon and something else, but more often than not something like Inkwell Leviathan will get the job done. This deck increases the consistency of its ability to cheat giant monsters into play by playing Animate Dead in addition to Goblin Welder. This gives you the opportunity to combo off on the first turn rather than having to wait until you can untap with a Goblin Welder. Perhaps the most interesting card in the maindeck is Possessed Portal. This card effectively prevents other decks from progressing their gameplans, since they can’t draw new cards. While you can just discard Squee and use your Goblin Welders to generate more value turn after turn, Possessed Portal will eat away at your opponent’s hand and board until they have nothing left. Perhaps the most exciting thing about this deck to me is the ease with which you could build a transformational sideboard if you were inclined to do so. You’re already playing Bazaar of Baghdad and Animate dead, which means you’re only a couple cards off of playing the Worldgorger Dragon combo. If, like me, you long for the days of Goblin Welder dominating formats, then this is one of the better takes I’ve seen in recent years. 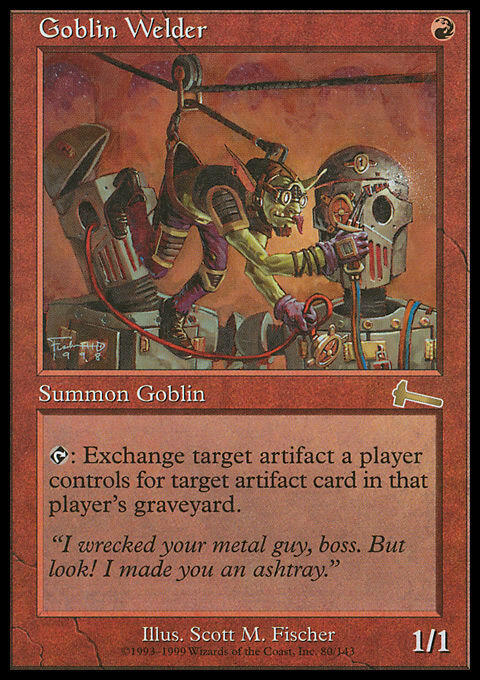 I’ll just be over here hoping that this is Goblin Welder’s chance to return to the spotlight.